Neu. Ist dem Original von 1997/98 sehr nahe. Hat eine Funktionierende Kadee #58 und eine Standart-Dummy-Kupplung. Sowie einen NCE DCC Decoder. Welcher nur zwei (2) Funktionen hat - Vorwärts und Rückwärts Fahrt. Für die grösser hat das TM eine beachtliches Gewicht und vermag doch in der Ebene 1-3 Wagen zu ziehen oder zu Stossen. Jenach Wagen grösse und Gewicht. 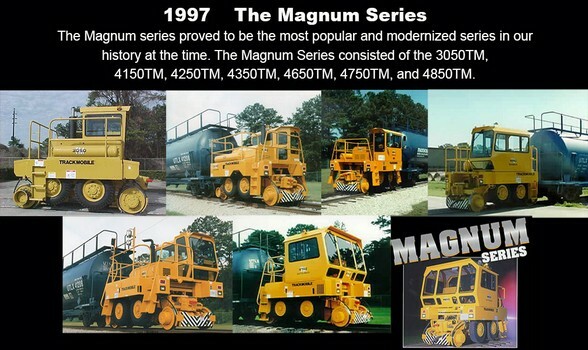 The Trackmobile is a unique piece of railroad equipment. It was designed as multifunction and multimode industrial switcher. It has the ability to operate on rails as well as off. With raiseable road wheels, the Trackmobile has the ability to spot freight cars, and move on to the next job despite the tight confines and limited trackage of most industrial layouts. 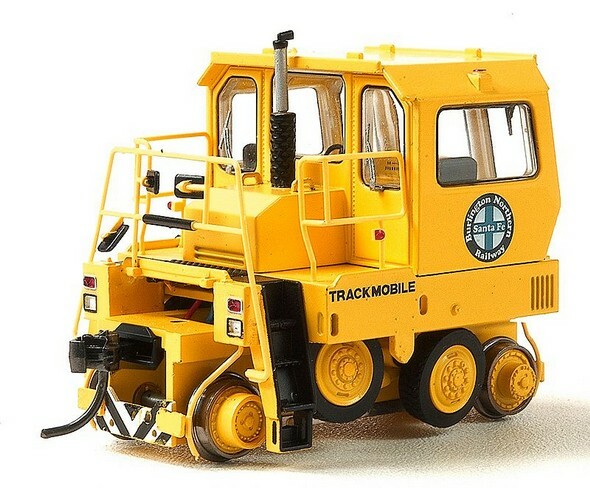 While initially developed for the industrial environment, the Trackmobile has moved beyond this, and now may be seen on a number of Class I roads. It is often seen on small local area work trains and occasionally, doing some light switching. This model is available in both a DC and DCC version and will certainly be a unique and functional addition to your layout. Every attempt has been made to ensure this decoder complies with all applicable NMRA Standarts and Recommended Practices. Daten von einem anderen Modell mit Full width Cab. Da die Magnum Serie nicht mehr gebaut wird. The Hercules Full Width Cab is Trackmobile’s mid-range capacity model. It is designed specifically for use in metro/railway tunnels. Operator's cab, interior dome, one clear, one red. Rail Mode & Road Mode - 6 LED lights, 3 each front & rear. 2 tail & stop combination, rear mounted. 2 Lateral work lights to illuminate roadbed. Totally enclosed 360 degree visibility. Sound level under 85 dBA. Two doors, front & rear. Isolation mounts for body frame and cab. Air supension seat with 180° swivel. Full instrumentation with digital video display. Cup holders. Rear coupler alignment camera. Arm rest controls. Rearview mirror. Cab heater. Defroster fans. Sun visor. Windshield wipers and washers. Strobo light. Fold down jump seat. Blast type air horn, automatic backup alarm for road operation. Electric alarm. Fire extinguishers, air conditioning, auxilary transmission oil cooler, performance package (additional 3,900 LBS and 185 HP), battery wrap heater, cab window extension, camera location options, cold weather fluids, cylinder rod protectors, engine block heater, engine oil pan heater, foam filled tires, (GCS) Ground Control System, hydraulic tank heater, MAX-TRAC wheel slip control, MAX-TRAN® automatic weight transfer system, radio control, switch control spot light, train air charge indicator, transmission oil heater, track mirrors/cab side, track mirrors/off side, turn signals, V shaped snow plow, wide traverse couplers for sharp curves/long cars. * Actual speeds obtained will depend on grade, load, track conditions and other factors. ** Shipping height will increase by 1 1/2" due to rail flange plus any necessary truck blocking required. vom 27.04.2015 auf der Clubanlage - wurde nur Rudimentär geschnitten!